38 - $133.99 Only 2 left! 40 - $133.99 Only 2 left! 42 - $106.99 Only 7 left! 44 - $106.99 Only 6 left! 46 - $106.99 Only 1 left! Testing, testing. . . say are you tuned in? To the fashion scene that is. If you are receiving this message then you know how to push the limit. With a fresh geometric gray, black, and bright neon squares it's like you're living inside your television screen. While we've all seen this testing system, thrown into the public view by cable companies to test. . . something. Come to think of it, what are they testing? Are they actually brainwashing us? Wait a sec, is that why we finally have come to like cabbage. Huh, well that's life! Anyway, where were we? 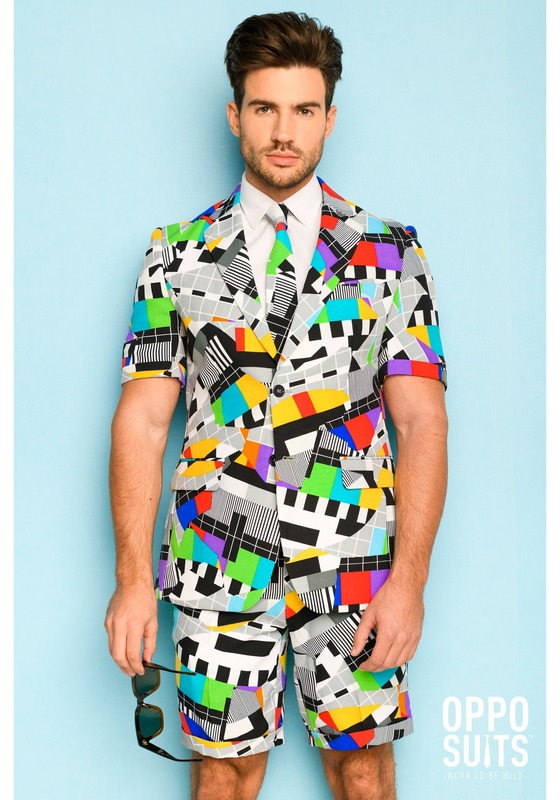 Oh yeah, we've all seen it but with the rise of the internet this iconic pattern is sure to die out sooner or later so why not celebrate it? In fact, this is why cable company leaders everywhere have come up with the odd yet surprisingly popular Testival. That's right a festival that celebrates the annoying yet strangely beautiful and unforgettable TV test system. 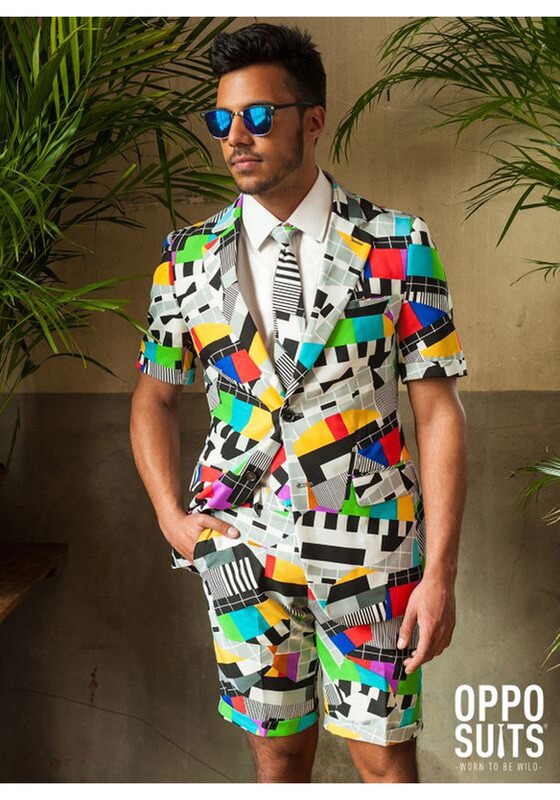 There's no better ensemble to wear to this strange event than this Avante-Garde suit. It works well for any other festival that you'll want to look suave and fashionable in. 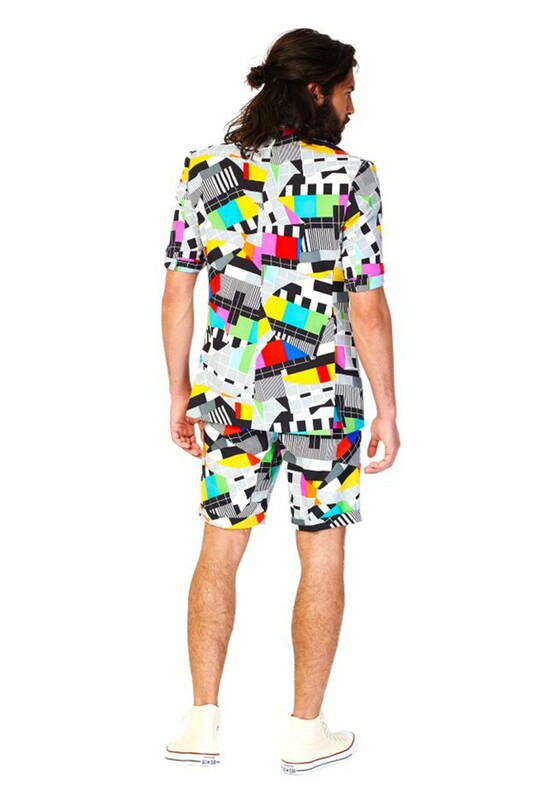 Wear it to the geometry festival, to the multi colored suit festival, or even to the Fancy Shorts Fest. Wait? Do we know what a festival is? Umm, well maybe you oughtta decide where to wear this sick psychedelic suit. With short sleeves and matching shorts, it's the perfect way to dress appropriately for the weather (as appropriate as you can be for dancing in a crowd of 10,000 people anyways). Get ready for the festival circuit this summer with this Opposuits original! With short sleeves and matching shorts, it's the perfect way to dress appropriately for the weather (as appropriate as you can be for dancing in a crowd of 10,000 people anyway). 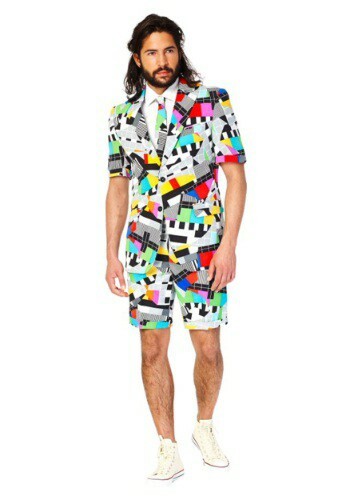 Get ready for the festival circuit this summer with this Opposuits original!